The first Sunday of May 2014 found Wendy and me enjoying Chatsworth Boxties at Kilkenny’s in Tulsa. We then took the turnpike southeast to Muskogee to Honor Heights Park. 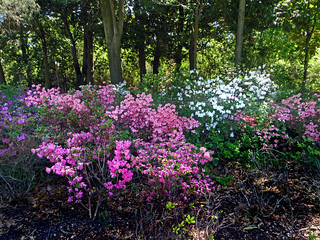 The park is best known for its spring Azalea Festival, but even with their late arrival this year, spring had sprung too far for us to see most of its 30,000 azalea plants in bloom. Nevertheless we did find several large displays of blooms under the shelter of some trees, with some blooms still blazing. In the warm afternoon, folks were gathered around the water on the west edge of the park. We walked along the west shore of the lake, enjoying the odd noises made by a Greylag Goose. Our path turned east to follow the north shore of the lake, and then we began climbing the big hill which dominates the east edge of the park. We visited the Azalea Festival plant sales area, where many colorful displays attracted our attention, with plants covered in blooms. Then we located the attractive waterfall, climbing a trail beside it up to the top of the reservoir hill. There we followed a narrow trail northward which must have been part of the park’s Audobon Trail, although I saw no signage. We passed through a green archway up on the top of the hill and then located the Henry Bresser Nature Trail along the top of the east edge of the hill. This quarter-mile trail was built in the 1930s using WPA funds and has somewhat neglected paths, seating areas, picnic tables, and fireplaces. We were out of sync with the planners’ routing, finding the trailhead at the end of our trek. 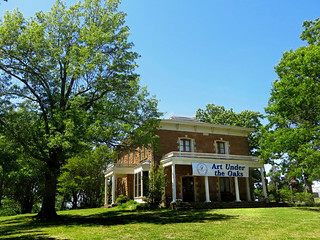 A blaring alarm led us to the Five Civilized Tribes Museum, which is housed in the Union Indian Agency building of 1875. Unfortunately it is closed on Sundays, so after the presumably false alarm silenced itself we had to be content with the vista of low tree-covered mounds to the southwest, looking past the imposing edifice of the VA Medical Center. We climbed down the hill, taking the lower stretch of the wooded Audobon Trail back to the waterfall. We crossed the park, seeing more cypress trees with their distinctive knees protruding out of the ground, and returned to our car, having walked 1.8 miles. I look forward to returning to the park in cooler weather to explore all of the Audobon Trail and see the arboretum and rose garden. We wrapped up our visit to Muskogee with a drive to see the downtown area and a visit to the struggling Arrowhead Mall, and then returned home. 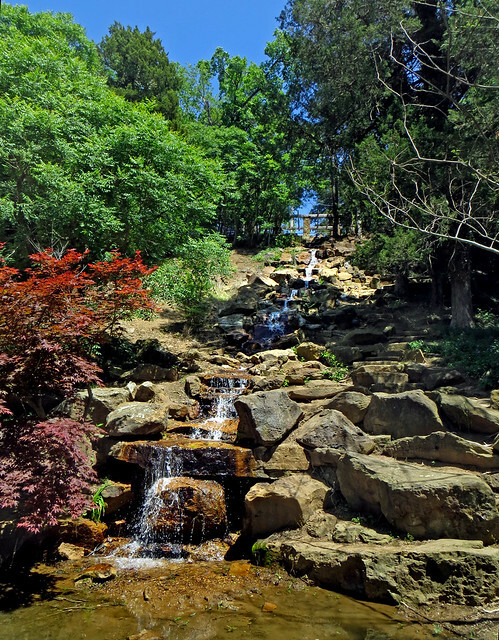 I’m glad I finally saw Honor Heights Park and shall certainly return some day.